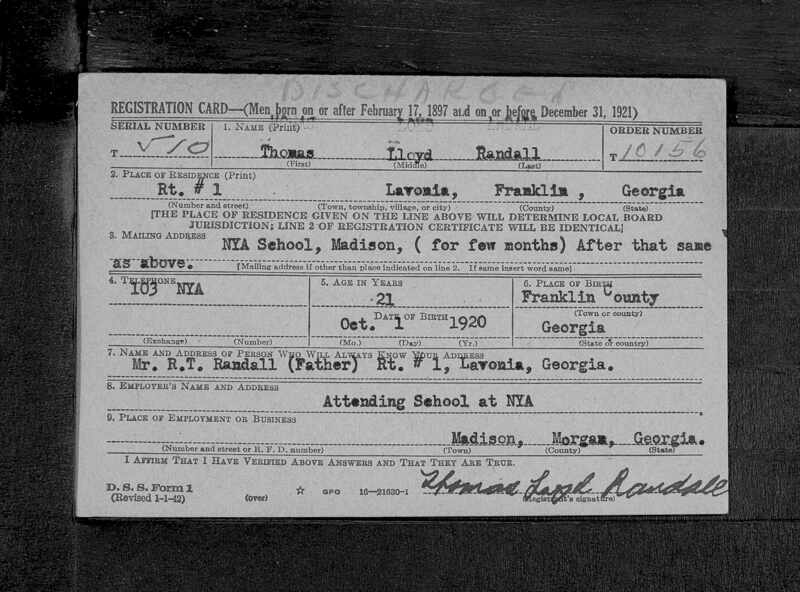 Thomas Loyd Randall's Draft Card. Civilian Occupation Semiskilled machine shop and related occupations, n.e.c. 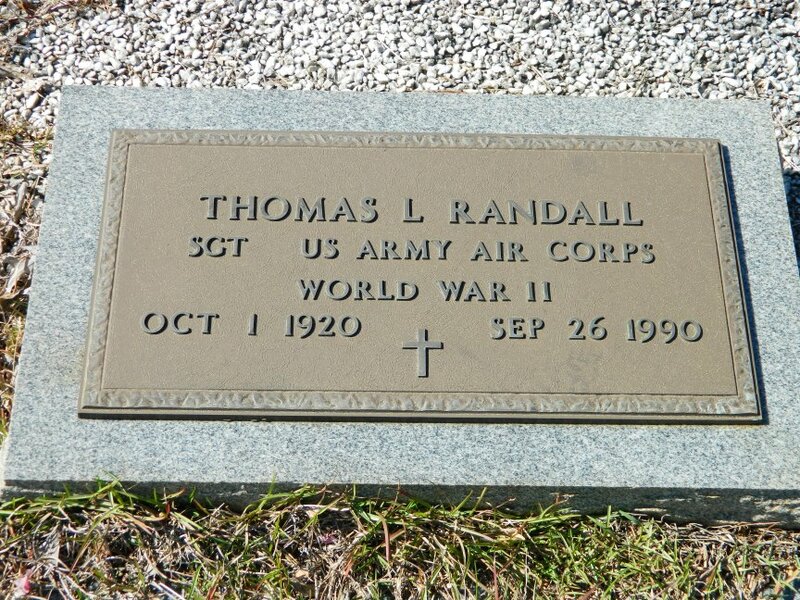 Source: “United States World War II Army Enlistment Records, 1938-1946,” database, FamilySearch (https://familysearch.org/ark:/61903/1:1:KMVX-H4V : 5 December 2014), Thomas L Randall, enlisted 15 Aug 1942, Ft Mcpherson, Atlanta, Georgia, United States; citing “Electronic Army Serial Number Merged File, ca. 1938-1946,” database, The National Archives: Access to Archival Databases (AAD) (http://aad.archives.gov : National Archives and Records Administration, 2002); NARA NAID 1263923, National Archives at College Park, Maryland. 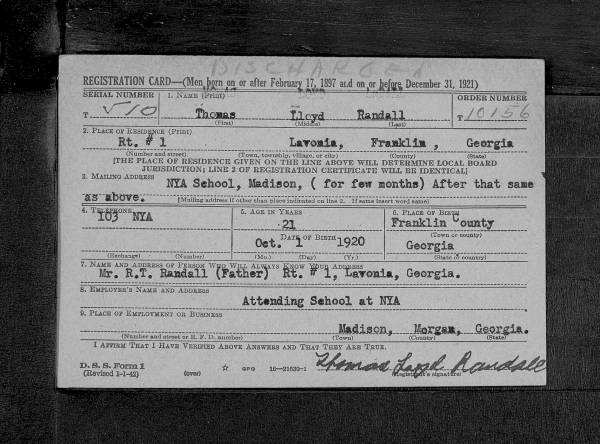 Thomas Loyd Randall married Lucy Anna Bartlett. 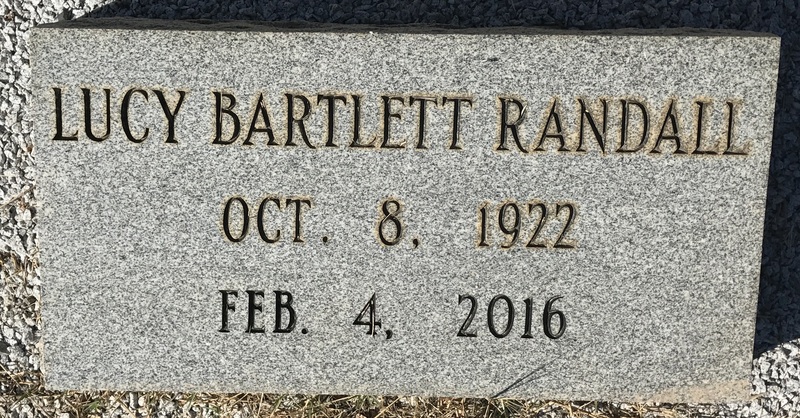 Lucy Anna Bartlett the daughter of Adolphus Hamilton Bartlett and Lillian Ann (Adams) Bartlett, was born in Bowersville, GA on October 8, 1922. Lucy (Bartlett) Randall, 93, of Lavonia, died Thursday, February 4, 2016 at Pruitt Health Care in Toccoa, GA.
Born in Bowersville, October 8, 1922, she was the daughter of the late Adolphus Hamilton and Lillian Ann (Adams) Bartlett. She was a homemaker and was a member of Pleasant Hill Baptist Church. Surviving are her daughter: Diane (Randall) Lee of Lavonia; sons and daughters-in-law: Rev. J. Thomas & Judy Randall of Pike Road, AL and David L. & Kathy Randall of Duluth; grandchildren: Kara Brannon, Jason Randall, Bryan Randall, Travis Randall, Andrew Randall, Crystal Allen and Tina Bradley; sisters: Rachel Randall of Woodstock and Mary Walters of Loganville; brother-in-law: John Randall; and 15 great grandchildren. 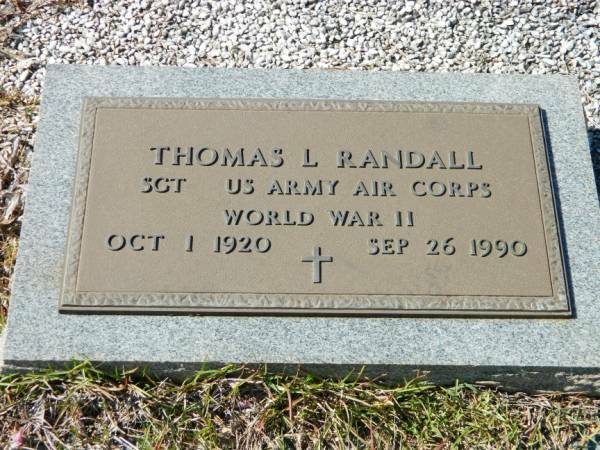 In addition to her parents she was preceded in death by her husband: Thomas Lloyd Randall; daughter: Carol Darlene Randall; siblings: Ray Bartlett, Ethel Lankford, Josephine Cole, Benjamin Bartlett and Chester Bartlett; and her husband’s family: Benjamin Herschal Randall, Cohen Randall, Herbert Randall, Morene Payne, Robert Nolan Randall and Janie Randall. Funeral services will be held 2:00 p.m. Sunday, February 7, 2016 at the Lavonia Chapel of Strickland Funeral Home with Rev. Josh Harvill, Rev. Rob Hill and Rev. Thomas Randall officiating. Burial will follow in Pleasant Hill Baptist Church Cemetery. The family will receive friends at the funeral home on Sunday beginning at 12:00 p.m. until the service time. Flowers are accepted or memorials may be made to the Pleasant Hill Baptist Church Building Fund, 1333 Pleasant Hill Road Martin, GA 30557. The following will serve as pallbearers: Dr. Jason Randall, Kevin Brannon, Bryan Randall, Travis Randall, Andrew Randall, Matthew Bradley, Shawn Tyler and Matthew Brannon.